Channelview High School held its graduation on Sunday, June 7 at Aldine ISD’s M.O. Campbell Center. The CHS top 10 students are, from left (by rank), Valedictorian Matthew Yates, Salutatorian Kaliah Glenn, Adriana Aguirre, Erika Richey-Carson, Jay-ar Haro, Jocelyn Ramos, Mary Ontiveros, Destiny Adkins, Judy Bich-Tuyen Truong and Christina Grueso. Houston, TX. June 4, 2015 – Texas Southern University presented a historic event with former Secretary of State Hillary Rodham Clinton by bestowing on her the first Barbara Jordan Inaugural Gold Medallion for PublicPrivate Leadership Award. The event was hosted by the Barbara Jordan Mickey Leland School of Public Affairs, Barbara Jordan Institute for Policy Research, The Thurgood Marshall School of Law, The Barbara Jordan Inaugural Gold Medallion Committee, and Congresswoman Sheila Jackson Lee. Allan and Linda Jamail of Jacinto City were on the Barbara Jordan Inaugural Gold Medallion Committee who helped plan the event. Before entering the building, each of the four thousand plus attendees had to go through the Secret Service’s security process of metal detectors and bomb sniffing dogs, Allan Jamail said. Clinton, the former first lady and wife of President Bill Clinton, is an announced presidential candidate seeking the nomination of the Democratic Party. According to Allan Jamail this was to be a nonpartisan event, not a campaign event, and Secretary Hillary Clinton, after receiving the award, was to give a Policy Speech on Voting Rights. However, Jamail says Clinton, after praising the late Congresswoman Barbara Jordan, a former TSU student, then fired up her speech and went into an attack mode, blaming some of her Republican rivals for the new laws that are making it more difficult for minorities and college students to register and to vote. She called for universal and automatic voter registration for all citizens reaching the age of 18, and a 20-day (or more) period of early voting in every state, before every election. Clinton’s speech identified the work of protecting and expanding voting rights as a critical part of her campaign. 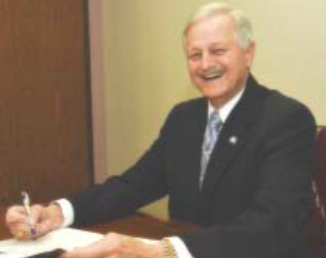 Dr. Charles Grant, San Jacinto College graduate and former president of the North Campus, holds four college degrees and believes in the value of education. He recently started an organization that provides training and certification services for continuing and professional development educators. Photo credit: Rob Vanya, San Jacinto College marketing, public relations, and government affairs department. HOUSTON – Dr. Charles Grant, San Jacinto College graduate and former president of the North Campus, holds four college degrees and is a firm believer in the value of education. In fact, he has spent almost all of his 35 professional years in the field of education. For San Jacinto College, Grant served as a professor and administrator for 25 years before changing careers. He then worked for three years as education and special projects liaison for Harris County Pct. 2 before joining the North Channel Area Chamber of Commerce as its president and CEO. Dr. Grant returned to the education field, launching his own organization – Continuing Education Association International (CEAI), an association that provides training and certification services for continuing and professional development educators. “I launched CEAI because I feel there is a real need to improve the quality of continuing education worldwide,” commented Grant, who worked at San Jacinto College from 1983 to 2008. “Most continuing education teachers are proficient in their career fields, but many have little or no formal training as educators. It’s one thing to know a subject, but it’s another thing to be able to convey and impart that knowledge to students.” During his tenure at San Jacinto College, Grant served as a director of continuing education, and later as a dean of continuing education. The College’s continuing education division is now called the Continuing and Professional Development division to more accurately reflect its wide range of training and education services. Grant is not only a former employee of San Jacinto College, he is a San Jac Certified alumnus, having earned an associate degree in general studies in 1967. He then earned a bachelor’s degree in business from Stephen F. Austin State University, a master’s degree in education administration and supervision from Sam Houston State University, and a PhD in higher education from Texas A&M University.